The Magical Unicorn is one block, in two sizes. There are no small projects that make obvious classes, but that does not mean that you can’t teach classes based on the pattern. In my own classes, I will follow the directions in the book and focus on specific parts of the pattern. In the same way, you can pick and choose which techniques suit your students best in the time frame you have. Improvisational piecing the rainbow stripes (pp. 4, 8): This is an especially good class for quilters who have not done much improvisational piecing. The only requirement is to sew together fabrics for each rainbow stripe that are similar in color and value and big enough to cut the applique pieces from. Freezer paper templates and gluing the turn-under allowance (pp. 9-11): Show how to use the freezer paper templates on top of the fabric and how to finger press, then glue, the turn-under allowances. 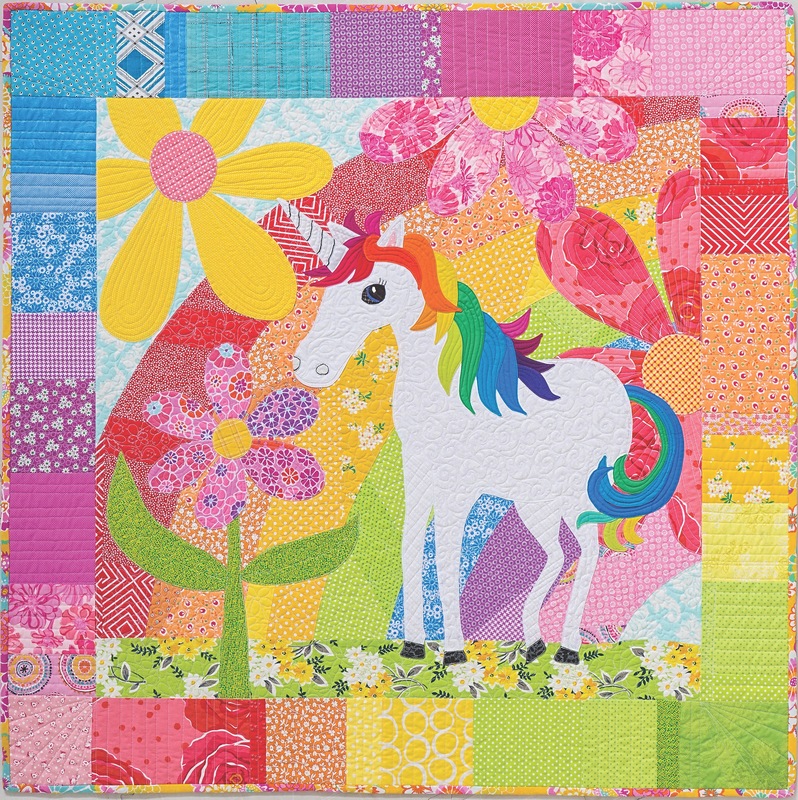 Color and design (p. 11; you can also refer to The Quilter’s Practical Guide to Color): Help your students as they color and design their Magical Unicorn blocks. This is not a hard quilt to color, which makes it a confidence builder. Straight-stitch machine appliqué (p. 12): Instead of trying to hide the appliqué stitches, embrace them! Sew with a straight stitch in matching thread. These stitches end up blending in with machine quilting. Hand appliquéing the eye (page 12): This would make a nice, 3-hour class focusing on off-the-block and cutaway applique.